A focus group is a form of market research where a group of people answer questions and discuss a product or idea. Focus groups are conducted on behalf of companies to find out what consumers think about their product, brand, competition, or ideas. Consumers are compensated for their opinions with cash, gift cards, or free product. Our team gathers focus groups from around the web and works directly with some of the top market research firms to bring you legitimate paid focus group opportunities. Every focus group on the site is hand-picked and verified. Use the navigation at the top of the page to Search by City or Search by State. Under the Search by City tab you will find the major cities/markets where lots of focus groups are being conducted. If you do not see your city listed we recommend using the Search by State tab and choosing your state. 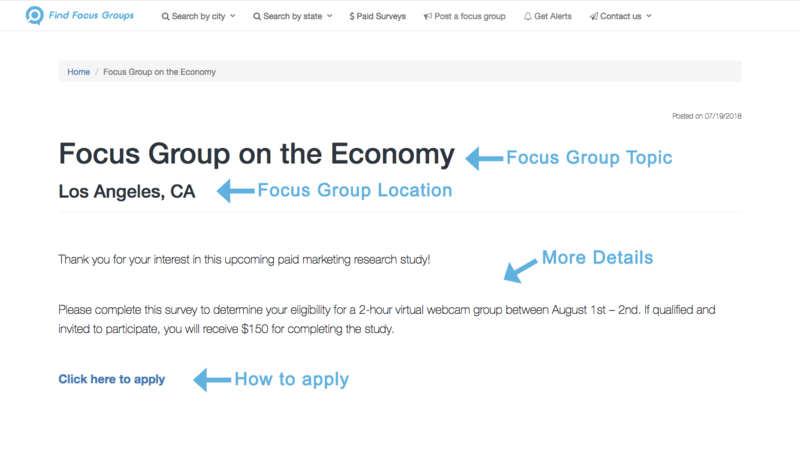 If you don't live in an area that conducts a lot of focus group you can look at Nationwide focus groups. These focus groups are conducted over the phone or computer, and it doesn't matter where you live! Look for a focus group topic that interests you and one that you would be a good fit for. Our listings will typically give a brief description of the focus group and will include details like: location, time, date, demographic requirements, and compensation. At the bottom of our listings there are instructions on how to apply. Typically there will be a link to a survey form to fill out. Sometimes you may have to call or email to apply. If you qualify you will be contacted by the company conducting the research. They will review your answers, ask you follow-up questions, and schedule you for the focus group. Because of the sheer amount of responses, you may not be contacted if you don't qualify for the focus group. Visit our Focus Group FAQ section or send us a message on the contact us page.